Fancy Faces of Rochester: My new venture into Sand Art starts tomorrow! My new venture into Sand Art starts tomorrow! The van is packed and I'm ready to go do my first Sand Art booth tomorrow at the New York State Family Outdoor Sportsman show in Henrietta, NY. I'm actually doing two booths next to eachother; one for face painting and the other for sand art. 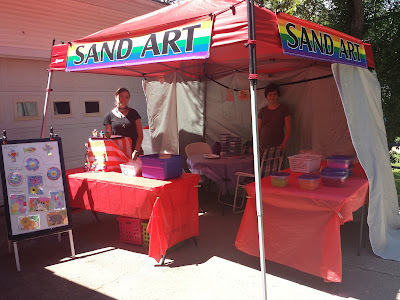 My daughter and a friend are coming along to manage the sand art booth while I do the face painting. I'm curious to see which one is going to be more popular. We did a practice set up on Wednesday on the driveway. Then we found out the weather is going to be bad all day at the event, so it's going to be moved inside. Trying to decide if we should still set up the canopy inside so we can hand up the signs or figure something else out. Thankfully, my husband is coming along to help us get set up. Hopefully people will still come out to the event in spite of the inclement weather. 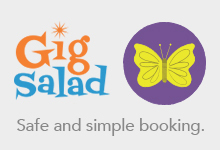 To find out more about booking us for a Sand Art Party, go here.